It is always entertaining to discover the ways that some of the most life-changing knowledge comes to our attention. What is even more amusing is that often these moments stem from what can initially be defined as a negative experience. Another example of modern day alchemy. We all have the power to turn a negative experience into a positive one. Before I lose everyone completely, allow me to share with you the exact experience I had and the realization that came out of it. The other afternoon I was riding my bike in the park. It was a rather hot day and I was taking my time enjoying nature in all its glory. Ahead of me was a young man around the age of 6 I would guess. As we rounded the curve in the trail there were a few birds sitting on the grass. As the young man approached them he yelled “Get out of here stupid birds! You are ugly! Goodbye stupid ugly birds!” It appeared the young man had really no malice in his words or towards the birds, but hearing that made my heart sink. My first reaction was to feel bad for the birds. I know this may sound silly as birds to not speak the same language as humans, but sending out that negative energy towards another living thing cannot be constructive. A little while later down the path, when asked his opinion of a certain tree, the child replied using the same descriptions of ‘stupid’ and ‘ugly’. Again, it is my opinion this was more a product of environment and not any malice as the young man seemed rather happy at the time. As I found my own spirit a little brought down by the young man’s words it got me thinking. In the past I would have felt a little foolish, or even weak for allowing another person’s words and actions affect me. Now I realize it is just part of my gift as an empath and spiritual person. The event stuck in the back of my mind as I went about my day. 3 a.m. found me awake and reading on the couch when the experience popped back into the front of my mind. I began thinking how someone should tell the young man about the law of energy. It may sound silly to do so to someone at such a young age, but if we wait often habits and language patterns can become set and harder to change. What is the big deal about what words we use? Imagine several random people coming up to you and informing you that you are ugly or stupid. Can you imagine how you would feel after that? Even if you give their opinion much weight, it still would not be a good feeling. Now, imagine several random people coming up with wonder in their eyes and informing you how beautiful or inspiring you are. Can you think about how that would feel? Words do not only affect others. When we, like the young man in the story, go around calling everything stupid or ugly. When we look for things to criticize about people, places and things. Our world becomes filled with things that we see as ugly, stupid or some other negative description. Can you imagine how it would feel to be surrounded by ugliness and stupidity every day, all day? By speaking in such a manner and seeking out the faults in everything we chose to do that to ourselves. With my feelings working their way downward as I was thinking about all of the people who do this to themselves as well as how often I still find myself doing the same thing, a great realization came to me. If we can make our lives a living hell by the words we chose to use, could we use that same power to transform our lives to one of beauty and joy? Of course we can. There is always two sides to every story. Immediately my mind began to work on how this could be put into use. The answer was simple. To create joy and positivity all we have to do is the opposite of what brought us the pain and negativity. In this case, what if that young man was taught to find the beauty and magnificence in everything he saw? What if we all learned how to see everything as a miracle. It was Albert Einstein who said, “There are only two ways to live your life: as though nothing is a miracle, or as thought everything is a miracle.” If one of the smartest minds on the planet lived by this concept, I felt it might be wise for me to as well. Today I am going to begin to look at the beauty in everything I see. In addition, I am going to use words like ‘wonderful’ and ‘beautiful’. If we find the beauty in everything we see, no matter how hard it may be, our lives will be filled with a great amount of beauty and joy. Can you imagine how different it would feel if we were surrounded daily by everything we thought was beautiful? Our lives, in turn, would become beautiful. One great key to finding the beauty in even the toughest situations was supplied to me by a quote from Mr. Rogers. This quote was sent to me by a neighbor who knew I was a fan of the children’s television show host. The quote was “Frankly there isn’t anyone you couldn’t learn to love once you’ve heard their story.” Perhaps if the young man in our story know that birds he was calling stupid could navigate 2000 miles without the use of a map he may not think they were so stupid after all. The greatest irony of all. After all the knowledge that came out of the afternoon in the park, the young man’s words became a thing of beauty for all they taught me and all I could share with you. Ah… the holiday season. Filled with great joy, family and feelings of love and gratitude. Sometimes, however, it is also filled with stress, feelings of being overwhelmed and stress. It seems we need another hour or a couple of hours in our days to get everything done. There is shopping, finding the perfect gift for people we discover we do not know as well as we thought we did. Often there is either travel, or preparing for the arrival of people who are traveling to see us. We have to shop and prepare meals considering everyone’s likes, food allergies and culture restrictions. Not only do we have all of these things to consider, but we also have our regular obligations of work, housecleaning and parenting as well. Sadly, there is no way to extend the daily deadline beyond 24 hours. How then, can we gain more time during the holidays? The man above you might recognize, his name is Albert Einstein. world-famous physicist. He developed the theory of relativity. I found this hard to grasp when it came to time. How can time be relative? Is not an hour always 60 minutes? I found the answer, and a great explanation on the theory of relativity in a most unlikely place. There is a home-improvement store here called Menards. On the bottom of all of their sales ads they have motivational sayings in real fine print. One fine day while pondering why I even live in a place where I would need a snow blower, I found the answer I was looking for. On the bottom of the page read “How long 3 minutes is depends on what side of the bathroom door you are on.” While I would love to claim credit for that great bit of wisdom I cannot. How does this translate to the relativity of time, and more importantly, how can it help us gain more time during the holidays? Think of that situation if you will. Yes, it is odd that a self-improvement website will ask you to think of spending time in the bathroom. I don’t know about you, but sometimes that is when some of my greatest ideas come to me. Have you ever had to use the bathroom when somebody else is doing the same? Every second can seem like an eternity. If you are the person on the inside the time would certainly seem different, yet they are exactly the same amount of time. That is the most poignant example I have seem, but doesn’t the same thing happen to us during the holidays? It seems when we have one more place to stop and it closes in a half an hour that is when we get into the line with the sweet little old lady paying for her cartload of groceries with change…of which she has to count out by hand. Wait, did she just loose count and have to begin again? How long have I been in this line? How about preparing meals. I have experienced this first hand. Please don’t misunderstand me, I don’t mean I actually prepared the meal. Watching Margie work so hard during the holidays to make sure everything is done at the same time, and that time being close to when our guests arrive is crazy. Especially when you have to consider everything cooks at a different rate. You may be thinking this is great Neil, and I have spent part of my holiday time reading this article and other than a entertaining bathroom analogy, you haven’t told me a single thing I can do to help my holiday craziness. Fair enough. Let us explore a few simple things we can do that will not only help us make better use of our time, but take the stress out of the time that we do spend, allowing us to enjoy more of what this time of year is all about. The most important thing that can change our holiday is focus. When we are stuck in the slowest line in the store, focusing on that can only raise our stress level and blood pressure. What if we chose that time to try and focus on what we have to be thankful for. 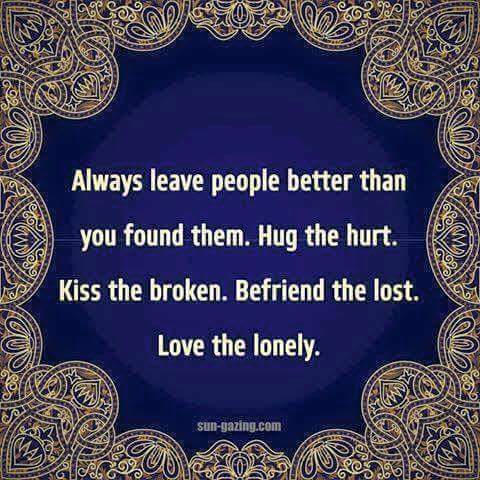 During the holidays that is something we all can count on and is a great gift to give ourselves. Even just a distraction whether it be reading those informative magazines telling us what the royal family is doing, or where Elvis, who is really alive, is spending his Christmas. Try to find the most interesting or amusing headline. Think of a nice thing you can say to the cashier, who truly is under a great deal of stress themselves. Another great thing we can do is think about the outcome we are striving for. Is the goal to provide a tasty and enjoyable meal our family can gather around and share the holiday? Then does it matter if the steamed vegetables end up being part of dessert or the gravy is not as smooth as we would like? Sure, it would be great if the meal was perfect, but that is not what the holidays are all about, and nobody will expect that. What if something goes terribly wrong? One year my aunt was supposed to watch a pot of soup that was baking as the rest of us went to pick up some other relatives. She…well…I am not sure what she did other than it wasn’t watch the soup. It burned and had to be thrown away. The entire pot tasted terrible, but there was other food and it is still a story we laugh about today. That brings us to our last point, find ways to laugh. Nothing is that serious and it is often things that go wrong that make the funniest and most entertaining holiday memories. Find a way to laugh, it will make a great holiday gift to everyone you share the holiday with. In that vein of thinking, try finding ways to genuinely compliment as many people as you can. Know and understand each of us face unique holiday stress and all of us would appreciate some kind words. Please feel free to share your holiday stress relieving ideas in the comments below. Working together we can make the holidays better for everyone. This quote from Albert Einstein is one of my favorites. It demonstrates a very important fact that we all could benefit from remembering. We must remember that every person we meet is amazing a special in their own way. Every job is very important. I believe in was Mother Teresa who urged us to do small things with great love. This point was brought to my attention as I indulged in 2 of my favorite past times. Watching a pig race while attending the Wisconsin State Fair. Pigs are some of my favorite animals. They almost always seem to be enjoying life to the fullest, are the consummate underdog, and are very intelligent. When you are at the fair you can see pigs in many different fashions. Some are in barns on display. These are usually checked out by animal lovers and looked at with distain by city folks sensitive to certain smells. They can be found smiling on many signs and shirts advertising a million different foods and products. A smiling pig is a hard thing for many people to resist. Speaking of food, you can also find pigs in some fashion on a breakfast sandwich, on a burger, or even on a stick. These definitions are where most people classify pigs. A humble, yet adorable animal. If you put a racing sash on them such as the one above and have them race each other for Oreo cookies something else entirely different happens. Thousands of people pack bleachers to standing room only during the 11 day run of the fair. During their 5 performances a day one can hardly find a seat if you do not get there early. They yell, jump and cheer for their favorite pig to make it around the track first. What happened? This is the same pig many of those very people would not even go into a barn to see because of the smell. In a different role, however, they became something to cheer for. Something to sit in the hot sun just to watch. People can even buy souvenirs after the race. In life we all can be like the pigs. Sometimes it can seem the world is against us. It may seem like there is nobody in our corner cheering for us. If it is because we live in a place that resembles a barn and we have an unpleasant odor, the solution is fairly obvious. Most of us, however, are just living the wrong role. Investigate your strengths. think of what you do well. Know what gift you bring to the world and live that. Before long, you too may very well have people lining up to cheer for you. Proof that inspiration can strike anywhere, let me share some advice from a very sage philosopher, Winne the Pooh. Yes, the childhood character created by A. A. Milne. What can we learn about living an amazing life from a stuffed bear? Plenty. These words actually come from the book The Tao of Pooh by Benjamin Hoff. It explores the different religious beliefs in the context of the characters of Pooh and his friends. Sounds crazy I know, but check it out, a great read. Ok, the part we are dealing with today is called the cottleston pie principle. It is based on a silly sound that Pooh sings as he walks through the Hundred acre wood where he lives. Again, the words seem simple, but the wisdom is hidden in there. We are going to look at one verse at a time. Here is the first. What exactly does all of that mean? Seems rather straight forward, but you would be amazed how many people do not understand. So many people are busy trying to be something they are not, or worse yet expecting everyone else to be something they are not. How much simpler would life be if we all realized our strengths and weaknesses and accepted others as well. Perhaps you have a coworker who is, shall we say…’sunshine challenged’ instead of viewing them as a burden, we can view them as a reminder to remain positive. You would no more use scotch tape to fix your car, than you would use a welding torch to put a torn piece of paper together. Everything has its use and purpose. When something seems ‘bad’ or ‘useless’ consider changing your view of it, or what you may use it for. Still having trouble accepting advice from a talking bear? How about advice from a world-famous physicist? These words come straight from Albert Einstein and happen to be one of my favorite quotes of his. They also echo the words of the world-famous bear above. So whether you repeat this quote to yourself or sing the verse above, it is important to remember everything, and everyone has a purpose and something they are good at. Do not be to hard on yourself or others. Maybe you just haven’t found what you are here for yet. As Einstein said, Maybe you just haven’t found your genius yet. Take a look at the people featured here. Do you know what they all have in common? The all excelled in a field that they were specifically told they were a failure in. Not ok, not average, but terrible. Can you imagine television without Oprah Winfrey? How about the music history without The Beatles? Einstein not only became a great scientist, but changed the entire way we view the world. Walt Disney not only did have an imagination, but filled the imaginations of countless children when he was alive and his companies continue to do so to this day. You may be saying “Neil that is all well and good for these people, but what does that have to do with my life?” The simple answer is everything! How many times have you been told you were no good at something? How many times have you tried something a couple of times or maybe even once and failed miserably at it? I know I have countless times. What do you do? Do you stick with it? Perhaps you just say to yourself “Well that was nice, but I guess it’s just not for me” or do you believe the words of the so-called “experts” when they tell you that you will not succeed? Sometimes these sources can be well-meaning friends and family members speaking out of their own fears. I have a hard time imagining myself pursuing a career in professional sports if I was cut from high school team like Michael Jordan was, but he did and went on to become one of the greatest of all times. How many dreams have we given up on because we have been told that our dreams are too unrealistic? Or that we lack the certain talent needed to achieve success in that field? How many times have we tried something and failed at it only to move on to something else. 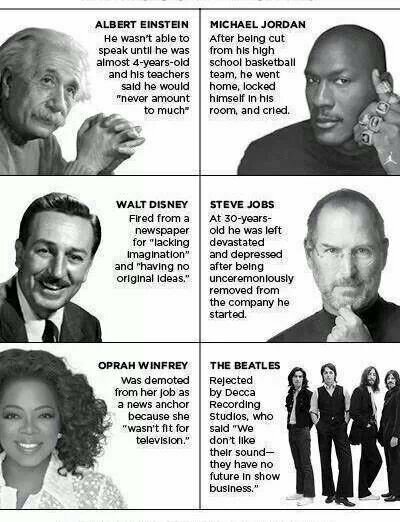 Take another look at the list above and imagine how the world would be different if these people had given up on their dreams? That is of course unless you are like poor Mr. Disney and completely lack any imagination.